There was another great winemaker dinner at La Pizza Fresca in New York last night. La Pizza Fresca is located on 13 East 20th Street in New York 's Gramercy Park .. The place has quite a uniqueness about it .. It's a restaurant that's makes some of the best Pizza in all of New York .. Or is it a Pizzeria? Well let's just say it's a Pizzeria / Restaurant, OK? Yes that's what it is. And the Pizza, this restaurant is one of the few that's certified as Vera Pizza Npolteana which is an organization that grades and certifies Pizzerias that meet the high standards of the best porperly made Naapoletan Pizza. La Pizza Fresca is one of only 1,000 Pizzerias in the world to be Vera Pizza Napoletan certified, nad just 1 of 100 in the United States ..
Well, anyway la Pizza Fresca makes some great Pizza. They also have a full menu of Antipasti, Pasta, Meat, Fish, and Poultry and they have one great wine list. Besides the great Pizza, La Pizza Fesca is realy into wine, and is in fact one of the top Italian Wine focused restaurants in New York. They have a great wine list that is very extensive and world class. And like they did last night that have many great wine dinners each year. The wine dinner I attended this night was hosted by Elisa Scavino who is one of Enrico Scavino 's two daughters working with him in the family wine business in Peidmont. Well the dinner was awesome, we started with Beef Carpacio, followed by some awesome Pizza, Pizza Funghi (Mushrooms) and Pizza Bianco with Fontina Cheese, Black truffles, and Prosciutto. The Pizza was amazing. We drank Paolo Scavino Barbera and Nebbiolo Langhe with the Carpacio, and ewere quite fortunate to have a couple of Paolo Scavino 's fabulous Barolo with the Pizza .. Yes, with the Pizza we drank Scavino's Barolo Carobric 2000 . This wine was phenominal. It was in perfect balance, full of great fruit and earthy flavors of Truffle and Mushrooms. You couldn't ask more from a great Barolo from one of the great Barolo vintages of all-time in the 2000 .. Lucky we were at the dinner to follow this great Barolo with Scavino's Barolo Bric del Fiasc 1998, 2000, and 2010 . Needless to say, they were all great, and drinking quite nicely. We were then treated to an amaing line-up of an amazing 3 Vintage Vertical Tatsing of Paolo Scavino 's Barolo Reserva Rocche dell' Annunziata. The vintages we had were 3 of the greatest Barolo vintages of all-time in the 1990, 2000, and 2001 ... Wow what a treat? It was a great night of socializing, drinking great Barolo accompanied with the awesome Pizza, Pasta, and Bue al Barolo (Beef Briased in Barolo Wine) and our gracious host Alisa Scavino talking about all the great winew we were drinking and of the histroy of the family's winery founded by her grandfather Lorenzo Scavino . Bravo Elisa !!!! 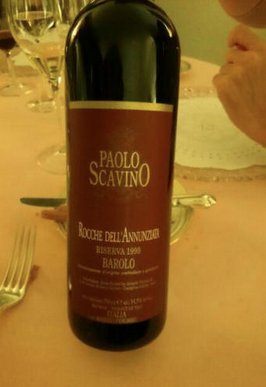 Paolo Scavino is an historical winery in the Barolo region. It was founded in 1921 in Castiglione Falletto from Lorenzo Scavino and his son Paolo. Farming has always been a family tradition and passion. Enrico Scavino together with the daughters Enrica and Elisa, fourth generation, run the family Estate. He started to work full time in the winery in 1951 when he was 10 years old. A young winemaker who inherited the passion and devotion for the land he belongs to. Through over 60 years of experience his focus has been to invest on important cru of Nebbiolo to show the uniqueness of each terroir. Their work is inspired by the love and respect they have for their territory and they pursue purity of expression, complexity and elegance for their wines from the three local grapes Dolcetto, Barbera and Nebbiolo. These values and culture have been carried on and never changed.